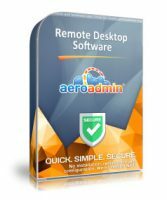 AeroAdmin – EASY remote desktop software! AeroAdmin requires no installation, registration and configuration. Its small in size (~2 Mb) and can be started up in less than a minute. It’s perfect for times when you need to connect to a remote PC as soon as possible for either a full on remote control session or a simple file transfer. AeroAdmin shows an ID number every time it’s opened. This number is what needs to be shared for someone else to connect to the computer. This number is static and bound to computer hardware, meaning it doesn’t change over time. You can also use your IP address instead of the ID. The admin computer needs to enter the client ID to make a connection. When the admin tries to make a connection for the first time, the remote client needs to enable access rights, such as screen viewing, keyboard and mouse control, file transfer, and clipboard syncing. The client can give or revoke any of these rights. Session will start immediately after client accepted the connection. AeroAdmin offers a very flexible 3-factor authentication system. In addition to manual accept of incoming connections remote admin can be authenticated by hardware ID or by password, or in a combined mode what adds extra security. AeroAdmin provides built-in option for instant sending of help requests to admin email. The messages are sent in a form of tickets containing all necessary data for instant connection. In fact, remote client can send help request to admin in a couple of clicks.